Home > News > Meeting the challenges with the help of caring others! Getting necessary teaching and educational equipment to the school in Nepal is quite the challenge for R Star’s one school. Early October Pam Wicks and Susan Brown were on their way to India and then to Nepal for the spiritual work they enjoy. They both agreed to add to their filled suitcases, a laptop computer each for the benefit of R Star’s school of 65 children, TOW-N (Top of the World Nepal, elementary school). “For over 6 months I have been attempting to get 30 desktop computers to Nepal, but the Nepali government requires ‘new’ items or the tax is more than the cost to purchase a computer there”. Being ‘creative’ as I am states Rosalind coming from the creative environment of Laguna, I have yet to get this accomplished, but I am closer by gifting another Nepal rural school 15 of the 30 with my new Nepali contact . He will locate 60 people to transport all of them… the tower for one person, the monitor and mouse with another person. The computers are all refurbished and with new programs ready to go… but they are in Montreal of all places through a donor. With half the desktop computers not able to arrive to TOW-N, an idea to take laptops also ready to go appeared with generous donors gifting their not so old ones to R Star for a write off while helping rural children with very few opportunities as we intend to provide. Here is where Pam and Susan helped with the successful transport of the laptops. Both women were hopeful to see at least our school in one of our 51 villages, but their preplanned trip didn’t have more than minutes between their busy itineraries. 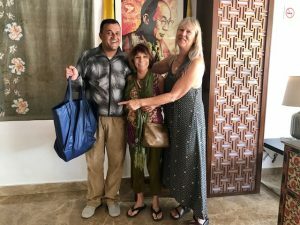 The lead man in Nepal, Rabindra, or Rosalind’s son who adopted her along with his siblings years back, “ with paperwork” Russell states, was able to meet the Pam and Susan personally while picking up the laptops moments before they departed for seeing a temple. It was instant delight to meet each other with hugs as Rabin called to tell his maaytae. He has heard many times about both women through “Maatyae” (Mom) Rosalind. He was not disappointed per Rosalind. Rabin said his heart connected with both of them immediately as Pam and Susan also related to Rosalind. The photo submitted are the 3 sweet souls with the 2 laptops ‘in the bag’ held by Rabin. Interested in helping R Star with a used, in perfect condition 4 years or younger computer or perhaps a Kindle which R Star has an intern load for immediate use, or you just wish to donate? Call 949 497 4911 or write RStar@pacbell.net or use the website to donate: www.RStarFoundation.org There are many ways to help and bless others.